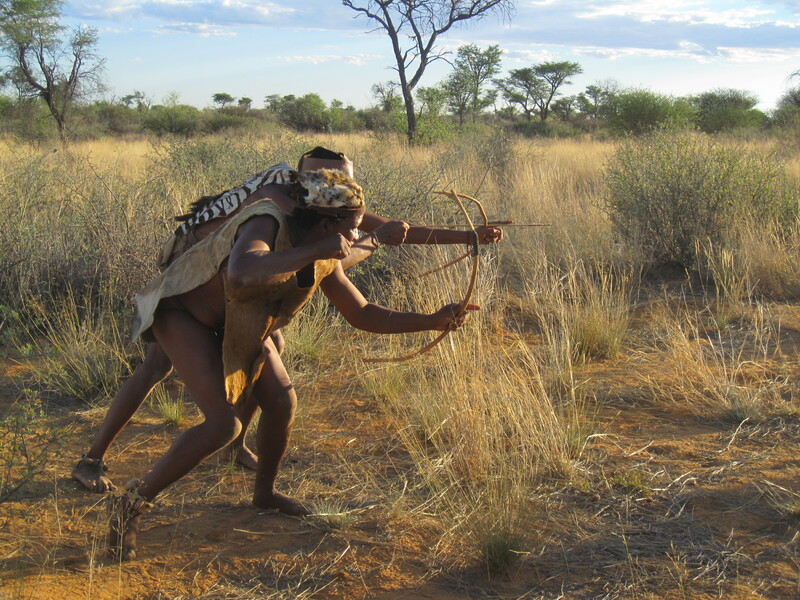 Sandune’s Lodge is known as the home of the San People, the Bushmen. Andrew, the owner, who greeted us graciously, communicated quite easily with the San people living in a small village at the edge of his property. We had arrived early to find traditionally designed, beautiful rooms, and breath-taking animal population. Our drive to the Bushmen village was short, but our transportation quite different. There were two jeeps, each with some room inside and one with a separate seating section on the top. Yes, that’s right, (don’t tell my mother) we sat on the roof of the truck! As we gripped at the handrails over every bump, we knew this ride would be special. We drove through the bush on sand tracks and after leaving the car we continued to head further into the bush hiking through blades of grass up to my waist. The journey was incredible and we hadn’t even yet met the people. We’re going to Botswana today!!!!! I decided to wear my Sand Lover’s Namibia shirt as it would be the last day in Namibia for awhile at least and I do love that shirt…it’s just perfect! We woke up to another beautiful day with a lovely breakfast provided by Andrew’s friendly staff. After thanking them for our wonderful stay, we were in the van and on our way for a long day’s journey to Botswana! Paul told us to pick up some sustenance for the road as it would not even be lunch on the run today, but lunch in the van so we could get to Maun with some time to spare-so everyone, well, almost everyone tried to get things that wouldn’t interrupt others when they ate, not smelly or greasy so we could manage for the entire day on a vehicle that had fussy aircon at the best of times. Anyway, we stopped a few times to look at some Baobab trees, those of the oldest of their kind, and Paul of course told us to ‘go hug a tree’ and so of course…we did! Not to worry; there are photos of that too! So, we ate on the bus and get this, Gayle, in her usual brilliance and inconsideration brought a can of tunafish. Now if you thought that was bad, wait for it…she opened it, spilled out the liquid in the garbage back at the front of the bus seated right in front of Dawn (who is so even tempered its unbelievable), ate a forkful of the tuna and then walked it around the van putting it under people’s noses asking them if they wanted any before throwing the rest out in the bag where it would then sit for the duration of our over six hour bus ride! Can you say EEEEWWWWWWHHHHAAAAA! This after she stuck her nose in my bowl of ice cream last night asking what exactly it was…don’t you just wonder how some people just don’t fall down more often? I digress, well, anyway, we had a very long bus ride and finally made it to another border crossing and got another stamp in our passports and made our way to a SuperSpar shopping center to go shopping for food. Paul was doing all of the cooking in the delta and supplying all of the food so we really only needed to bring water and any other things we would want to drink while in the delta; and yes, of course, in true Stacey fashion…not to worry, I brought all of the fixings for s’mores. We were there for just over an hour since there was a lot of shopping to do as we would have two breakfasts, two lunches and two dinners in the delta and food was to be provided for all of us and any extras would then go to the polers (drivers/polers of our mokoro boats out to the delta who would be camping with us the entire trip) and we had to bring everything that we would need in the delta as we were bush camping so nothing would be there when we got there and nothing should be there when we leave…you know the saying ‘take pictures, leave footprints’? Well, not only does it work for all of our traveling but is especially perfect for this journey into the delta. After getting some Botswanan money (PULA) and Gayle asking Paul if she went to an ATM in Botswana could she get American money out (yes, it really happened…you can’t make that nonsense up-and this woman is well and truly over the age of 21 when I do believe you should stop making exceptions for people) we headed to our hotel near the marsh and water as we could hear the sounds of frogs and stray cats when we arrived and were told again to watch for snakes! We sat by the pool to cool off from the long bus ride for a bit and after showering when we arrived at dinner we were told that Ma and Pa Kettle had a snake in front of their room and watched as it was tackled, caught and killed by the hotel staff…GROSS! Sorry, mom, I know I didn’t tell you about that but thought it best to leave it out in the phone conversations! Anyway, we went to dinner, with the awful thought of snakes slithering around and the sight of some of those stray cats near the buffet and found that our choices were buffet or off the menu. Now, the buffet was great for meat eaters, but not much for vegetarians and some other people decided to wait and order off of the menu too. Mathew got the buffet which was the better idea as he could eat right away, but Eveline and I decided on the veggie burgers on the menu. Well, after waiting about 45 minutes with the wandering stray cats and the giant-sized Botswanan bugs, it came and well, they were truly veggie burgers! Sauteed veggies on a bun with sort of soggy fries…crazy right? After having a good laugh and of course taking some photos of my Botswanan fries, we ate our quite tasty and interesting dinner and headed off to the room to pack while being careful of slithering snakes! We had to fix our luggage as we had to take only a day pack or small bag of only what we could carry ourselves into the delta. Whatever we didn’t need would stay in the van as Karel was staying at the hotel while we were in the delta to watch the rest of our belongings; and he says he hates boats! So, since everything was in those small boats it would be day pack, water and sleeping bags and if you couldn’t carry it it couldn’t come…needless to say we both had to repack! So, we went back to the room, shut the door tightly, cranked up the aircon, sorted our stuff and tried to get some sleep. Well, we woke up this morning and just about missed breakfast but boy was it nice to actually sleep in real beds in lieu of those sleeping mats and our trusty sleeping bags. Food and bags were done and as we left Lee, Christine and Carsten waving at the front door of the hotel, we chatted with Maria (who’s allergic to tomato) and Bernardo and met Ian (British aeronautical engineer in the British Royal Air Force) and his wife of a few years Louise (who can‘t eat milk products), a British lawyer living in London…and immediately we were excited to make new friends! Young couples, our age…not something we had found a lot of on this tour so we new the next few days would be really great! We drove through Windhoek on a quick city tour as we didn’t get to do one yesterday and then we were on our way to Sandunes Lodge, run by a nice man named Andrew. Andrew’s lodge was known as the home of the San People, Bushmen, and Andrew easily communicated with the people who lived in these small villages on the property. We arrived to find beautiful rooms, available wildlife and a possible interaction with the San people. We were introduced to Andrew and his staff over a lovely lunch of chicken (well, not for me) and salad and then we had some time to hang around before we would go to the Bushmen village if we wanted. We relaxed, I did my nails and everyone was kind of enjoying the lazy afternoon before the ride. Our drive to the Bushmen village was short, but our transportation was the interesting feature of the afternoon. There were two jeeps with some room inside but one had a whole separate seating section on the top; yup, that’s right…we sat on the roof of the car! (this is something to definitely tell your mother after she knows you have all of your limbs after the journey was over) We felt every bump as we drove and gripped onto those bars for dear life; but I have to say that the ride was awesome…scary, but awesome! We drove through the actual bush on sand tracks that were nowhere near close to being considered roads by any stretch of the imagination and then we got out and walked further in the bush after we had parked by a bunch of reeds that again wouldn’t be considered a car park spot by anyone…but it was amazing. We continued to walk through the bush, swatting the flies and mad that even when we asked Paul if we could wear skirts/shorts and thongs he said yes but of course we would have preferred long pants and shoes, and eventually we arrived at what looked like a makeshift village where at least six adults, two teenage boys and a few children were staying in stick-made huts around a man-made fire. They wore very little clothing, stayed in these tee-pee huts, spoke their own language, used old school methods of hunting and trapping animals, were totally nomadic, played with sticks, drank out of ostrich eggs and sang and danced for us as Andrew translated our conversations. They demonstrated how they lived, how they trap animals and how to make a poison to place on the end of the arrow, how to make jewelry out of ostrich eggs (they put some pieces in the fire to get a different color for the necklaces but they were all created from the same shell) and altogether how they lived. When a very young boy (less than two) kept grabbing for Gayle’s water and she wouldn’t give it to him I gave him ours. His eyes lit up and he was ecstatic. He needed help lifting the bottle and the water dribbled down right onto his bare belly which you could see growing bigger with every sip he would take. He was adorable. Those big eyes looking up at me as he drank and then he attached himself to my leg when he was done and I had wiped his belly of the extra water. Andrew told us later that the reason he had trouble with the water bottle and tipping it and holding it was because he was used to drinking out of ostrich eggs which were a completely different entity altogether. 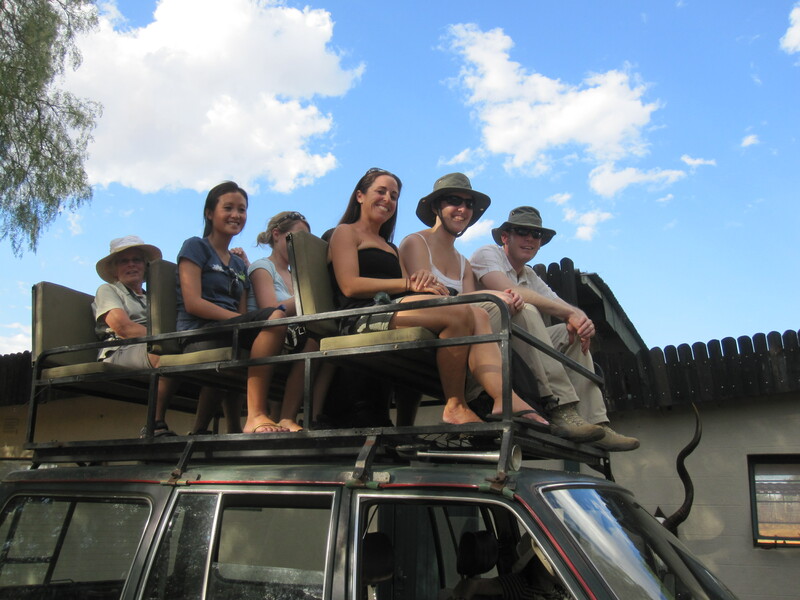 When our visit was over, after we attempted (poorly) to shoot the arrow to a target but got a good laugh out of it, we waved goodbye, jumped back on our dangerous seats perched high atop the jeeps and were back at the lodge just in time for dinner. Dinner was lamb on a spit and I chose not to join the others as not only was it too difficult for me to see the lamb but the awful noise of the cutting in the back just ripped right through me. Paul said that it certainly was not the first time that someone had chosen not to join this dinner and Andrew generously made me a separate vegetarian dish of the best pad thai I had in all of Africa and had it brought to the room for me. Not only was the food out of this world but the service was so sweet. I finished eating and brought my empty plate to the kitchen and joined everyone else for ice cream as they had finished eating as well. After witnessing another amazing African sunset on our journey home and the great food for dinner, we thanked Andrew and headed for bed as tomorrow was a long driving day to Maun after a bit of time on the bus. Sadly, we had to say goodbye to Namibia-a place I never knew I’d absolutely fall in love with and want to journey to again and again. It is so very easy to comprehend Angelina Jolie’s love for these beautiful people and this gorgeous land. I’ve learned so much on this part of our journey, things you couldn’t learn in a book or even on television but things you had to see and experience on your own, with your own eyes and your own heart. Things that made you feel deep in your soul and changed your view of the world and the things there are to do and the people there are to meet. Everyone we interacted with was wonderful and so incredibly genuine. Their land and way of life might be different to that of our own but it has merit and benefits beyond your wildest dreams. Each person we met seems to truly enjoy his or her life to the fullest and not take any day for granted, a lesson that is not taken lightly. I can’t wait to come back to Namibia, there is just so much peace and beauty here to experience and it gets into your soul and deep into your heart.